Love designs with strong geometric shapes -- circles, triangles, etc. So I figured, how hard can it be to draw a few circles? And why can't I keep my craft room neat for longer than 10 minutes? 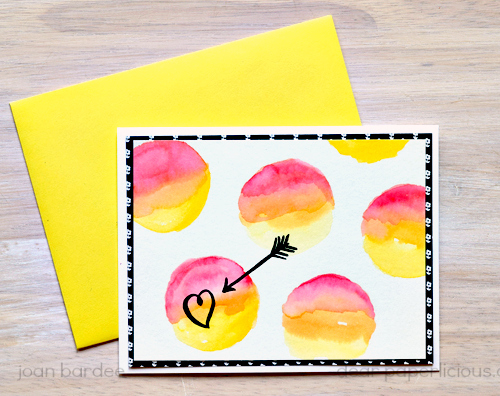 Stamped circles with a solid circle stamp and watercolored. Should try this again, but the first go round (HA!) was a blotchy mess. Drew circles and watercolored them. Learned that I can't draw circles. Made a mask out of typing paper and a circle die and drew the circles using the mask and a pencil. Not bad. Watercolored with Tombow markers and erased the pencil lines when dry. Stamped the heart and arrow from Essentials by Ellen (by Julie) Love You So, trimmed patterned paper from Stampin Up, and adhered everything to an A2 card. Added some Wink of Stella clear glitter to the heart because why not? And, get ready, wrote a note inside the card, and MAILED it! MOOD WHEN DONE = Maybe I'll try triangles next. How hard can that be? How hard can that be - famous last words :-) At least for me. I love your pretty circles. I watched someone's video - maybe Francine? - and she used a stencil with different size circles, so I bought one the other day and will give that a try. I can't draw circles, squares, or triangles - unless they're supposed to be wonky. Haha! You MUST be reading my mind 'cause I always think that! Wow, I clearly am worse than I think I am! 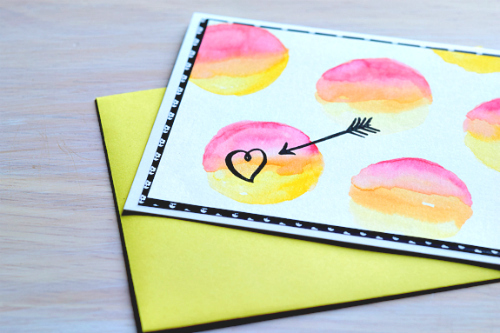 lol ANYWAY, the card is great, love the watercolor color-changing circles! 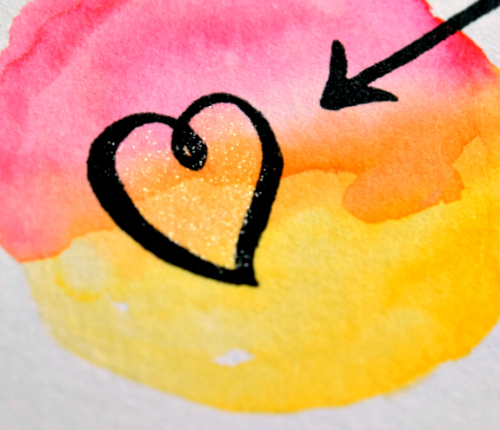 Love this, Joan, the watercolor circles are super fun! Just goes to show that creative people have more perseverance! Cute card, too! My hand has a mind of its own when it comes to drawing so, yes, I'd have to use a stencil, too. Love how this turned out. You're so good with the watercolors. Can't keep my craft room neat, either.